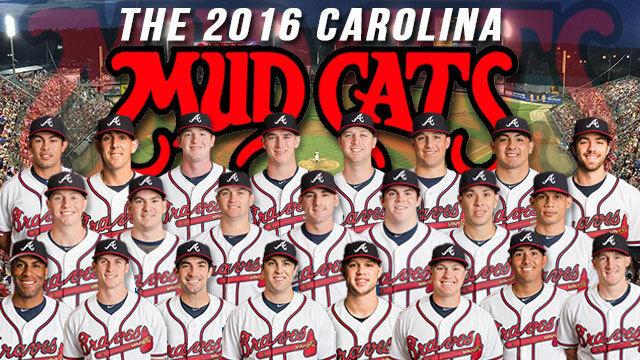 ZEBULON, NC - The Atlanta Braves today officially set the initial Carolina Mudcats opening night travel roster for 2016 season. The Mudcats travel roster features the number one overall draft pick from the 2015 Major League Baseball draft in INF Dansby Swanson and Atlanta's 2014 first round selection in OF Braxton Davidson. The roster also includes returning Mudcats players OF Sean Godfrey, OF Keith Curcio, C Joseph Odom, INF Reed Harper and INF Joey Meneses. In all, the opening night travel roster consists of nine returning Mudcats from the 2015 season, including eight players up from Class A Rome. Four players will make the jump from Class A short-season Danville and two who were recently acquired via trade by Atlanta. Swanson is one of the two new Mudcats to have been recently acquired by the Braves via trade. He was the primary piece in an off-season trade that sent All-Star pitcher Shelby Miller from the Braves to the Arizona Diamondbacks last December. Arizona originally drafted Swanson with the first overall pick in the 2015 Major League Baseball June draft. He is currently ranked as the 17th best overall prospect in Minor League Baseball by Baseball America. Swanson is also listed as the top prospect in the Braves system by the same publication. Up from Class A Rome and joining Swanson in Carolina's infield this season are INF Jordan Edgerton and INF Omar Obregon. Edgerton was a 2015 mid-season South Atlantic League All-Star and is originally from Mount Holly, NC. Obregon led Rome with 31 steals and collected 121 hits last season. The new Mudcats infield also includes returners in INF Ryan Gebhardt, Harper and Meneses. Gebhardt joined the Mudcats in September and appeared in just three games with Carolina in 2015. He also played with the Mobile BayBears (Arizona - Double A), Visalia Rawhide (Arizona - Class A Advanced), Kane County Cougars (Arizona - Class A) and with Rome last season. Harper was promoted to the Mudcats from Rome in May and played in 82 games last season. Harper spent 68 of those 82 games at second base where he posted a .993 fielding percentage. Meneses was Carolina's primary first baseman last season and finished the year batting .239 with 18 doubles in 94 games. The outfield will be made up of returners in Godfrey and Curcio and newcomers in Davidson and OF Joseph Daris. Godfrey began the 2015 season with the Mudcats before a promotion to Double A Mississippi last June. He hit .304 with 73 hits in 62 games with the Mudcats last season before the promotion. Curcio was moved up to Carolina last May after putting up a stellar .342/.416/.479 line over his first 32 games with Rome. He then went on to bat .241 over 101 games with the Mudcats in 2015. Davidson, like Swanson, was also selected in the first round of the Major League Baseball June draft. The Braves selected him with the 32nd overall pick in the 2014 June draft. He spent the entirety of the 2015 season with Rome and batted .242 with 10 home runs and 23 doubles and 45 RBI last year. Davidson is currently ranked as the 15th best prospect in the Braves system by MLBpipeline.com. Daris hit .272/.336/.396 over 127 games with Rome in 2015. His 107 total hits last season were made up of 13 doubles, 12 triples and four home runs. He also finished the season with 23 stolen bases and 57 runs scored. Odom and C Tanner Murphy will handle the catching duties for the Mudcats to start the 2016 season. Odom totaled 48 hits; including 16 doubles and seven home runs over 65 games last season with the Mudcats. His 2016-year began with an invitation to Major League Spring Training camp. Murphy comes to the Mudcats after spending the 2015 season with Rome where he hit .193 with seven home runs in 98 games. The Mudcats pitching staff will feature returners in RHP Wes Parsons, RHP Carlos Salazar and Cary native RHP Max Povse. Povse and Parsons combined to pitch in just six games last season with the Mudcats. Both had their 2015 campaigns cut short due to injury. Salazar, meanwhile, was 1-1 with a 4.38 ERA over 10 games with the Mudcats last year. RHP Zack Bird joins the Mudcats after finishing the 2015 season with Double A Mississippi. Bird was originally drafted by the Los Angeles Dodgers in the ninth round of the 2012 MLB June draft and was acquired by the Braves as part of a trade last season. Bird was 1-1 and posted a 4.26 ERA over three starts with Mississippi after the trade and 5-7 with a 4.75 ERA over 17 starts with Class A Advanced Rancho Cucamonga before the trade. RHP Enderson Franco, RHP Raymar Navarro will both make their organizational debuts for the Braves while with the Mudcats this season. Franco pitched for the Bowling Green Hot Rods and Greensboro Grasshoppers during the 2015 season while with the Tampa Bay Rays and Miami Marlins organizations. He pitched to a 3.89 ERA in 13 games and was 5-6 with Bowling Green last season. He also went 1-6 and posted a 7.29 ERA in 12 games with Greensboro. The Cuban born Navarro comes to Braves after spending a number of years in Cuban National Series play. Moving on to Carolina by way of Rome are RHP Sean McLaughlin, RHP Zach Quintana and Clayton's RHP Evan Phillips. McLaughlin split the 2015 season with Danville and Rome after the Braves selected him in the 19th round of the 2015 June draft. McLaughlin was 0-1 with a 4.43 ERA in 11 games with Danville and pitched to a 1.02 ERA in nine games with Rome last year. Quintana pitched in 32 games and started in 17 last season with the Rome Braves. He finished the year 5-6 with a 3.25 ERA over 113 and 2/3 innings pitched. Phillips, a Clayton High School alum, was selected in the 17th round of the 2015 draft by the Braves out of UNC Wilmington. He combined to pitch to a 2.73 ERA over 18 total games between Danville and Rome last season. He was 1-1 with a 0.68 ERA in six relief appearances with Danville and 1-2 with a 4.41 ERA in 12 relief appearances with Rome. Making the jump from Class A short-season Danville and joining the Carolina pitching staff are 2015 draftees RHP Ryan Clark, LHP Chase Johnson-Mullins, LHP Ryan Lawlor and RHP Matt Withrow. Clark was a fifth round selection by the Braves and finished his first professional season at 6-1 with a 3.08 ERA in 13 games, including seven starts with Danville. Johnson-Mullins appeared in 16 games for Danville last season and was 0-3 with a 2.81 ERA over 25 and 2/3 innings. Lawlor pitched to a 2.50 ERA over eight games and seven starts with Danville in 2015. Withrow went 0-4 and pitched to a 3.56 ERA over 13 starts last year with Danville.